A drive along the A11 motorway from Pistoia to Lucca takes you to Valdinièvole and it is here that you find Montecatini Terme. The town has many thermal springs which have been famous since the dawn of history for the healing properties of their waters. In Roman times the town was a stopping off place on the ancient Via Cassia which linked Lucca with Pistoia and Florence. Caught up in the alternating fortunes of its capital Pistoia, Montecatini was reborn at the end of the eighteenth century as a result of the patronage of Grand Duke Leopold II of Lorraine who decided to radically overhaul the town and make it into a smart centre with straight, wide avenues and hundreds of hotels capable of hosting many thousands of tourists during the spa season. Its mineral water springs are highly effective in treating digestive tract, liver, stomach, intestine conditions and for cell renewal. 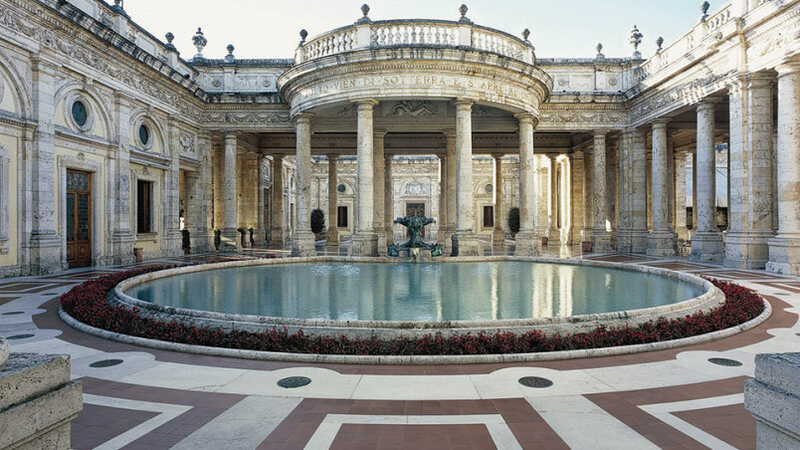 Beautiful spa bath buildings were built around these springs and given beautiful names: the monumental Tettuccio, the Terme Regina, Leopoldine, Tamerici, Salute, Torretta, Excelsior and Redi. From the second half of the nineteenth to the beginning of the twentieth centuries Montecatini was well known as a fashionable destination and popular with the VIPs of the day. Giuseppe Verdi was a fond habitué of the then Locanda Maggiore. Composers Gioacchino Rossini, Pietro Mascagni and Ruggero Leoncavallo, the writer Luigi Pirandello and satyric poet Trilussa also stayed in Montecatini. 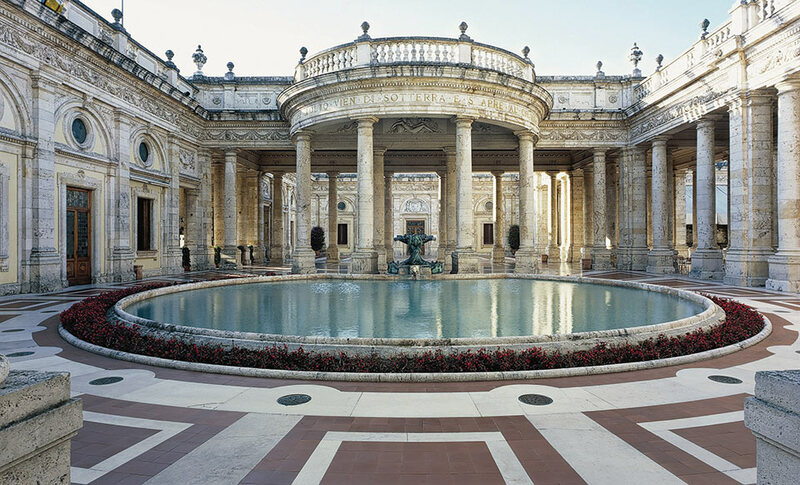 Worthy of note along the wide avenues of the town centre are, in the Corso Roma area, the Grand Hotel La Pace with its majestic interiors and Galileo Chini frescoes and the Kursaal, once a great 1300 seat theatre now converted into a modern residential complex. There are some wonderful shops, bars, restaurants and meeting places on these streets and, on Viale Verdi, there is Caffé Gambrinus with its terrace and the Locanda Maggiore’s famous loggia looking out onto its inner courtyard. The building was the Grand Duke’s idea and had a section for paying guests and one which was free for poor travellers. The Chiesa di Santa Maria Assunta, built in 1962 and designed by architect Raffaello Fagnoni, is in the same square and is worth visiting for Giorgio Scalco’s splendid Windows, Sauro Cavallini’s Crucifix and the painting work Cristo fra Marta e Maria by Aladino Ghioni. Walking along Viale Verdi you can notice some metal plates in the pavement, on the two sides of the promenade; on each plate is written the year of visit and the name of celebrities of politics, culture, show business sectors, who visited and enlighted Montecatini with their presence, making this promenade a real Walk of Fame. Did you know that … The piano played by Giuseppe Verdi in occasion of his vacation periods in Montecatini, is hosted in the local Banca di Credito Cooperativo della Valdinièvole headquarter.